Get Certified right here in the UK! Get your PADI scuba certification with DM Scuba who are an official PADI Training centre! If you’ve always wanted to learn how to scuba dive then you've come to the right place! Discover new adventures or simply see the wondrous world beneath the waves, this is where it all starts. DM Scuba teach in very small groups, never more than two students per instructor. We're not a production line dive centre and offer a much more personal course to suit your timescales. We also teach exclusively in Dry Suits at no extra cost so you'll be warmer in the water allowing you to enjoy your dives more. You'll complete four pool and theory sessions on Thursday evenings at the Filton Leisure Centre in Bristol, we complete everything on the one evening each week, for four weeks. The open water dives will take place over a weekend which will includes four dives over the two days. We have lost of options avialable and different combined packages so you can save money as well! See below for further details. 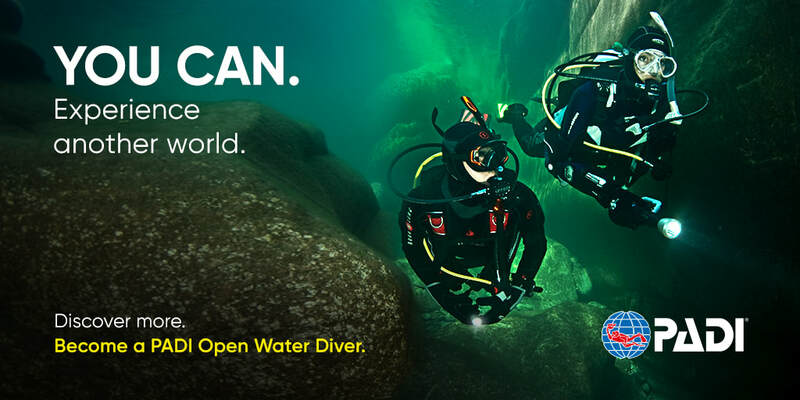 3 - Open Water Dives to review your skills and explore! To enrol in this courses you need to be at least 10 years old, be able to swim at least 200m without stopping, be able to tread water for 10 minutes and fit into one of our school dry suits or supply your own exposure suit for the Open Water dives. By enrolling in this course, you are acknowledging that you are able to do that. You will also need to complete a standard PADI Medical form which may require a doctor’s signature to say you are fit to dive if you have any pertinent medical history. If you've never suffered from any of the conditions listed, you can sign it yourself. The fun part about this course is . . . well, just about all of it because learning to dive is incredible. You breathe underwater for the first time (something you’ll never forget) and learn what you need to know to become a certified diver. During the course, you’ll make do four pool dives and four Open Water dives at a local dive site under the supervision of your PADI Instructor. In the PADI Open Water Diver course, you learn to use basic scuba gear including a dry suit, compass, and standard accessories. The full Open Water course! Everything you need to become a qualified diver. PADI’s Open Water Diver materials cover what you need to know about basic scuba diving skills, terminology and safety procedures. Your Open Water Crew Pack is included in the course price and is yours to keep! For each concept you’ll read a description and watch the DVD as well. Then you’ll jump in the pool to practice these skills with your instructor. Later, as a certified diver, use the course materials as a reference guide for future diving adventures and to review what you learned.